Kyber Crystals are alive and live through the Light Side of the Force. The Sith take these crystals from the sabers of Jedi that they have defeated as a ritual, and then the Sith must dominate the crystal via the Sith's force of will. This is no easy task. Mustafar, the volcanic planet where Kenobi defeats Anakin Skywalker and Vader later takes has his personal fief, has a Dark Side nexus beneath its crust. Inquisitors, first seen in the form of High Inquistor Tremayne from the WEG D6 Star Wars RPG supplement--Galaxy Guide 9: Fragments From The Rim-becomes canon! 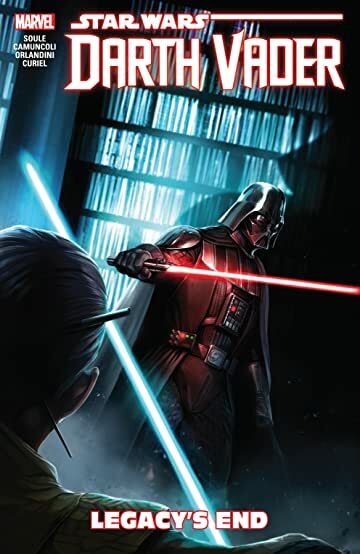 This Vader story explores the Inquistorious and introduces the Grand Inquisitor! Palpatine created the Inquisitors to hunt down and destroy those Jedi who have evaded death after the Purge. The Emperor put the Dark Lord in charge of this endeavor. In training his new men, Vader maims each of them while testing their skills--cutting off a limb on that one, making a near mortal wound on that one--to teach them "loss". D6 RPG Note: Inquisitor Tremayne has some cybernetic parts. It could be retconned to say that Vader did that to him. 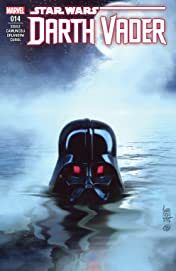 The story of Vader's first adventures continue in the second volume: Darth Vader Dark Lord of the Sith - Legacy's End. And, again, it is excellent. Remember Jocasta Nu? She's the old librarian that Kenobi sees at the Jedi Temple on Coruscant when he asks about Camino. This book turns her into a very cool character. The new Vader book has some new tech that is worthy of mention. We see some of the functionality of Vader's armor. It's not just for protection, and it doesn't just keep him alive. For example, he takes a data crystal, inserts it into one of those boxes on his belt, and inside the helmet, he sees the read-out. A Jedi Archive is revealed. Picture the last scene of Raiders of the Lost Ark, except in a Star Wars context. Remember all the boxes of stuff? There are lots of different types of light sabers. And, we see this huge rifle--it's the Star Wars version of a rail gun. I uses a lightsaber for ammo! You heft and fire the thing--it's got a heck of a kick--and the bolt it makes cuts through anything. There's a huge hold in the wall after using it. I started reading the new Darth Maul book (comic), and I saw something that confused me. The book shows Palpy with the screwed up face, and this book is set pre-TPM. Am I wrong that Palpy got the scary face from the discharge of his own Dark Side energy when Mace Windu reflected it back upon Palpatine? Or, did he have the face all along, only using some Force power to disguise himself throughout the prequels? If a mistake, it shocks me that Marvel/Disney would make such a mistake in a Star Wars book. EDIT: Doing a quick Google on the net, I see that there are two side of this argument. Some believe, as I said above, that Palpatine became deformed via his own Dark Side energy being reflected back at him from Mace Windu's lightsaber. But, there's another side that says that Palpatine has looked like this for a long, long time, and during his fight with Mace Windu, Palpatine's true face was revealed. 2nd EDIT: This makes me wonder....Snoke is all screwed up, too. I wonder if this has something to do with whatever it is that is out in the Unknown Regions--whatever it was that allowed Palpatine, and then Snoke, to become very strong in the Dark Side of the Force. Does whatever it is, out in the Unknown Regions, have a side effect that it will nearly kill you and deform your body in order to get the extreme Dark Side power? I started reading the new Darth Maul book, and I saw something that confused me. The book shows Palpy with the screwed up face, and this book is set pre-TPM. Really? You're shocked? Disney canon publications have had all manners of mistakes. But to be fair, they are only continuing the status quo from the days of the EU which was also chock full of mistakes and contradictions. It's a mistake, unless they have officially changed things from before. Back in the days of the prequels, there was a popular fan theory that Emperor Palpatine's face was his true face, and that he was using the Force to conceal it. Lucas himself officially denounced that even before RotS, revealing that the face he gets is the result of something specific that happens in RotS, which we saw when he was battling Mace Windu, the overload of constant generation of Force Lightning to hold him back. In RotJ he took breaks from shocking Luke to gloat, so that checked out. On top of the holograms, Darth Sidious appeared in a live action scene in TPM and AotC each. The bottom half of his face clearly wasn't melty-face in those. While I am not surprised, there is still no excuse for this mistake. Really? You're shocked? Disney canon publications have had all manners of mistakes. See above for one. I have no interest in listing them all for you. You're probably one of the most well-read here on the Disney canon. But even from what I've read, I see no difference from EU. The new canon was their chance to start fresh and do things right this time. But instead it is just more of the same. The reason that I've asked is that I have read a lot, and I haven't caught any other problems in the comics besides what I list above. But instead it is just more of the same. I can't believe that you think that. There is a lot of difference in the new Disney canon and the old EU. One big honkin' difference is that, in the EU, the New Republic succeeded! In the Disney canon, the New Republic never really gets it together--is never the Republic of old--and gradually falls apart until the FO and Starkiller base puts the last nail in the coffin. That's not at all what I was talking about. I was talking about the fact that the EU made mistakes, contradicting the films and itself. Disney canon publishing continues to do this. New universe, new storylines, same publishing issues. Oh, I thought that you were speaking of the new Marvel comics. Sitting in the library, waiting for my mom to get her weekly bout of books, i decided to read the capt Phasma comic, which shows her escape from Starkiller base, and eventual reunite with the imp fleet..
MAN her hunting down/framing of that LT was cool, but bloodthirsty..
AS was her 'ending' of that tie pilot she had assist.. Being a fan of Calamarians, I picked up a trade paperback that has the canon version of Imperial subjugation of Mon Cala (as they are calling the planet these days). The trade is a compilation of a 5-issue story arc (plus an annual) from the Star Wars: Darth Vader comic book. I had my doubts since I am generally not engaged by villain-protagonist stories. In addition to Vader, this story had Palpatine, Tarkin, Raddus, and Ackbar. There are spoilers below if you plan on reading this. It's one year after the formation of the Empire. The Empire had sent a diplomat to make an offer for Mon Cala to join the Empire, but the king rejects it because it required Cala to produce something at any quantity requested at small fraction of its value on the open market, in exchange for Imperial "protection" during a time of relative peace in the galaxy. The diplomat is supported by a star destroyer in orbit commanded by Tarkin, and Palpatine orders Vader to take a contingency of inquisitors to Cala due to a feeling that the king is being advised by a Jedi. He is. The Jedi is a former Iktotchi padawan with one broken horn who survived Order 66. He is driven by a vision of the future where a Calamarian fleet will be the backbone of a galactic rebellion that will defeat Palpatine. And somehow this padawan has figured out that Vader is Anakin Skywalker and learned about Order 66. The Jedi has a group of followers that he had gained by posing as a Jedi Master and using the Jedi Mind Trick on them to join him. As the diplomat returns to the star destroyer on a shuttle, the shuttle is destroyed, a plot by the Jedi to start a conflict. Of course the Empire blames the Cala king for the assassination and the battle begins. The story establishes that the planet has few surface cities as most of their civilization lies under water, and the Empire ends up destroying virtually all surface constructions. In one encounter, the Jedi, without a lightsaber drawn, defeats a group of Inquisitors by using the Mind Trick on their supporting stormtroopers to make them execute Order 66, which they do by attacking the Inquisitors (all former Jedi). When Vader captures the king, the Jedi shows up and a lightsaber duel begins. During this the king realizes that his Jedi adviser was the one who had destroyed the diplomat's shuttle and started the conflict, so he tried to order a cease fire of all Mon Cal forces and contacts Tarkin, telling Tarkin they'll accept the terms and begging for the Empire to stop killing his people. Tarkin says he'll send a shuttle and accept his surrender, but until them, the Imperial assault will continue. Of course Vader kills the Jedi but not before the Jedi gloats that he has set things in motion towards the eventual downfall of the Sith. Raddus commands a group of five Mon Cal star cruisers that rise out of the sea and battle with the Empire, losing two cruisers before the other three escape from the system. The artwork in the book was pretty good, but I still felt the comic was pretty meh. The Jedi character was created just for this story and dies in it, and it just seemed contrived to have Vader and the Jedi here. I think it would have been more meaningful if the Jedi character had been a Mon Cal or Quarren, but they probably went with Iktotchi because they have visions of the future, and so they could have a more deranged appearance with the broken horn. And I was hoping that this story would recanonize WEG's Ackbar background of him being a slave of Tarkin, but Ackbar escaped with Raddus in the three Mon Cal cruisers. I thought the EU background really helped Ackbar's character have more meaning in RotJ - Ackbar had learned everything he could about the Imperial war machine and was haunted by the references to the Death Star, only to later face a Death Star. It would have been easy to put that part of Ackbar's WEG backstory into this comic because Ackbar actually had a minor role here - Raddus was the main Mon Cal military commander in this story. Oh well. But yeah, having Ackbar reduced to an extra in Raddus' shadow disappoints me as well. Raddus was awesome, but Ackbar (IMHO) was a greater character and seeing him playing second fiddle (even to Raddus) is a bit of a letdown.